We are working on two projects related to cyberbullying prevention. Focus Group Studies to Understand Cyberbullying in Schools. This exploratory work studies the effects of emerging app features on the cyberbullying practices in high school settings. These include the increasing prevalence of image/video content, perceived ephemerality, anonymity, and hyperlocal communication. Based on qualitative analysis of focus groups and follow-up individual interviews with high school students, these features were found to influence the practice of cyberbullying, as well as creating negative socio-psychological effects. For example, visual data was found to be used in cyberbullying settings as evidence of contentious events, a repeated reminder, and caused a graphic impact on recipients. Similarly, perceived ephemerality of content was found to be associated with “broken expectations” with respect to the apps and severe bullying outcomes for those affected. Results shed light on an important technology-mediated social phenomenon of cyberbullying, improve understanding of app use (and abuse) by the teenage user population, and pave the way for future research on countering app-centric cyberbullying. This project aims to define new approaches for automatic detection of cyberbullying by integrating the relevant research in social sciences and computer science. Cyberbullying is a critical social problem that occurs over a technical substrate. According to a recent National Crime Prevention Council report, more than 40% of teenagers in the US have reported being cyberbullied. This is especially worrying as the multiple studies have reported that the victims of cyberbullying often deal with psychiatric and psychosomatic disorders. Specifically, this research will advance the state of the art in cyberbullying detection beyond textual analysis by also giving due attention to the social relationships in which these bullying messages are exchanged. A higher accuracy at detection would allow for better mitigation of the cyberbullying phenomenon and may help improve the lives of thousands of victims who are cyberbullied each year. The results of this research will also open doors to employing social intervention mechanisms to help prevent cyberbullying incidents in future. The findings from this research will also validate and refine existing theories on cyberbullying and potentially advance the field by creating a wave of data-driven analysis of the phenomenon. The generated data set will be made available to the larger research community, thus enabling new findings that can help counter this social problem. Vivek Singh, Marie Radford, Huang Qianjia, and Susan Furrer. “They basically like destroyed the school one day”: On newer app affordances and cyberbullying in schools. (To Appear:) Proceedings of the international conference on Computer-Supported Collaborative Work and Social Computing (CSCW). ACM, 2017. We gratefully acknowledge the support from the National Science Foundation for this project. We are also grateful to our collaborators at the Rutgers Tyler Clementi Center and the Graduate School of Applied and Professional Psychology for their continuing support of this project. 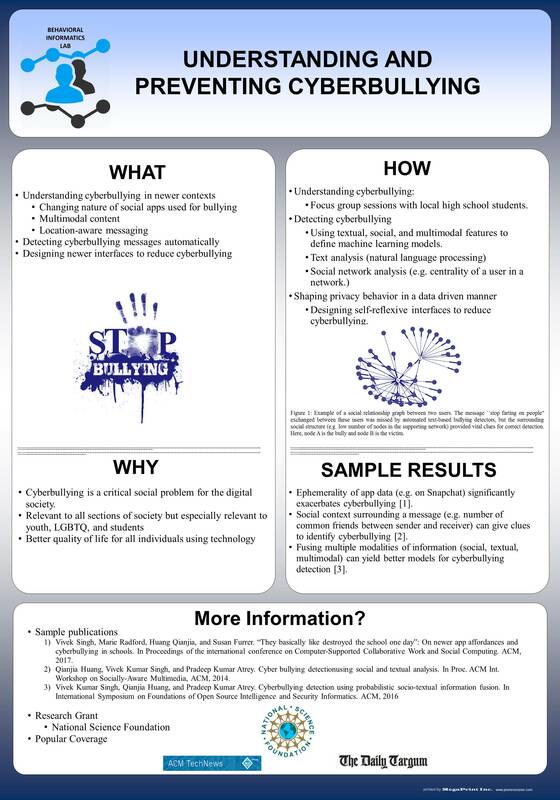 We are happy to share the cyberbullying labeled dataset with other interested researchers. We would ask you to sign an agreement respecting the privacy of the users in the dataset. Please email Prof. Vivek Singh (v.singh@rutgers.edu) to request the dataset.